Roberto Martin made this impressive destruction shot for his final Maya course project combining Maya particles, fluids and Pulldownit plugin, he tell us some details of production in this article. Tornado( twister) shot is my final Maya Advanced course project at Trazos School in Spain. My teacher at Trazos warned me that if I planned to do a scene very heavy in terms of “objects dynamics” then using Maya rigid bodies will be surely painful because Autodesk has taken centuries without fix or update it and it takes kind of forever to calculate. My teacher proposed me some plugins which I had seen before in internet, I tried them a little, sadly they were not entirely stable and had a thousand and one parameter to edit, besides I was looking for interaction with force fields like wind or newton, however using those plugins was maybe possible to demolish a wall-brick, but definitively not intended for blowing up a mill or a barn using Maya forces. So I searched Internet and then found Pulldownit , the web-site looked nice so I downloaded the demo version and after some testing I must say t was incredible stable, I’ve got good results very fast so I started to use it. Regarding the twister itself I made it emitting particles from some NURBS cylinders, the particles moved around the cylinders using simple expressions, just displacing their UV position over the surfaces. After I got the motion I wanted for the particles, I made them emit fluid, the result was good but too uniform., so in order to generate chaos I finally used two different fluids, one of them was controlled by the particles and have no density, and the second was more chaotic but binded to the other, in this way I´ve got some control in its trajectory. I used a density ramp and self-shadow attribute to mix both fluids in render. For breaking the buildings my first idea was to use a Volume Axis field affecting PDI objects, but after doing some testing I couldn’t get the desired result, then I realized I needed more fields for the tornado effect, one for attracting fragments and another one for spreading them out. As I had near 25.000 objects in scene it was very difficult to adjust fields properly for all of them, so I decided to go little by little, I started with the house, leaving everything else as passive. After getting the house destruction done as I wished, I followed with the mill and then the barn. Finally there were two Volume axis fields for the house destruction and one Vortex and one Newton for the rest. 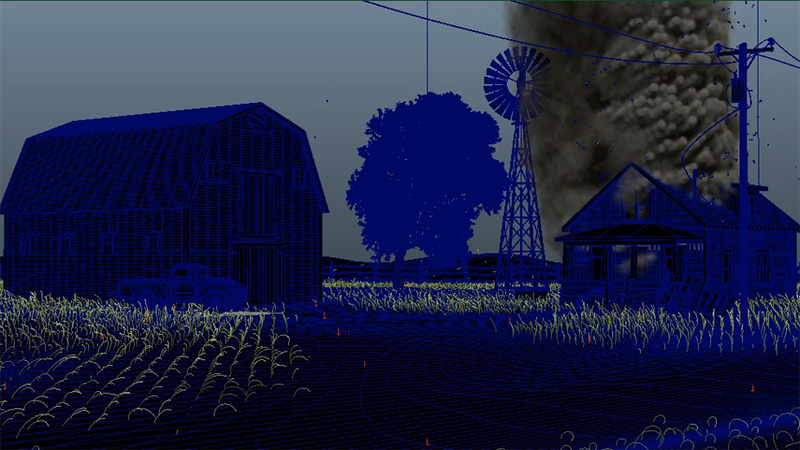 I made by hand the animation of the truck, because I wanted it to roll and go straight towards the viewer, I animated it independently in a different scene, in this way I avoided all the overhead of the rest of the scene, which was too heavy, then importing the keys into the tornado scene. I used PDI advanced fractures to set some parts of the fracture bodies more solid and difficult to separate and other much weaker, specially the slates. I set the floor as passive so it doesn’t move, several large thin planks gave me some issues in dynamics, they were crossing the floor or got “hooked” on it, so I had to fix a few keys by hand or simply removing those planks from the scene, the rest went smoothly, behaves quite real and was completely stable in such a heavy scene. Roberto Martin is already working in the CG insdustry, looking forward new videos from you Roberto whenever you have time!